Figure 1. 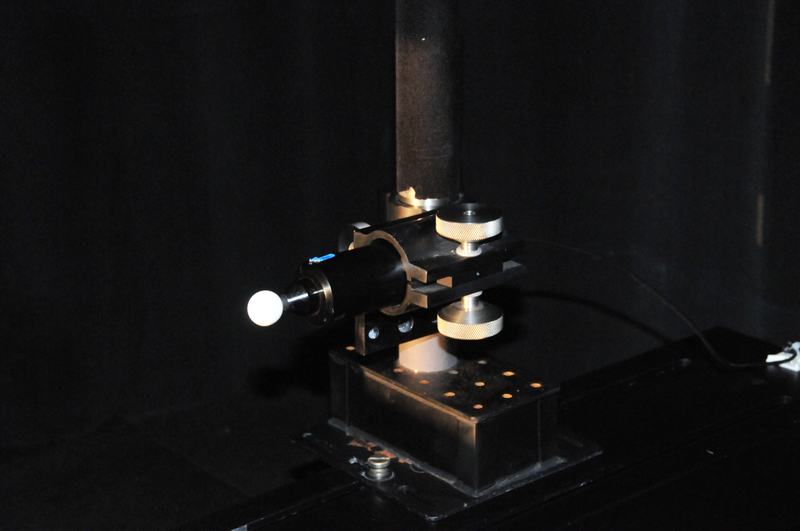 Scalar irradiance collector mounted on a computer controlled rotary table illuminated by a 1000 tungsten halogen lamp. A similar computer-controlled rotary table is inverted and mounted above a large water tank and the collector is illuminated through a quartz window on one side.The directional response of an instrument is its sensitivity to light sensor as a function of the angle of incidence of that light. For example, a cosine collector has a directional response that ideally varies in proportion with the cosine of the zenith angle of incidence. This means the signal will have a maximum responsivity to light from directly overhead (local zenith) and should have no responsivity to light coming directly from the side or below. Scalar irradiance sensors (Figure 1) ideally respond equally to light independent of direction. Examples of different directional response are found here. Directional Response Characterization measures the directional response of a sensor or instrument for comparison with the ideal. Directional test data for scalar collectors is typically identical when the instrument is used in either water or air. "Cosine" response collectors typically have somewhat different directional responses depending on if they are being used in air or fully submerged in water. For this reason, the design of in-air and in-water cosine collectors have structural differences, and their performance is verified by testing either in air or in water at our facilities. Usually, Biospherical measures the directional response in-air of all scalar collectors before final instrument assembly to verify the quality of the collector. Individual scalar response directional test data of the finished sensor is available for a small fee. Cosine collectors are characterized for the particular instrument model, and the customer can request that the individual instrument directional response be measured, either in air or in water for the instruments. Consult Biospherical for cost estimates.